Chicago Teachers Rally, March for "Fair Contract"
Hundreds of Chicago Public School teachers marched along downtown streets demanding a "fair contract" after hearing their leadership demand new revenue sources to fund it. The contract between the teachers and the school district expires June 30. That contract was reached after a seven day strike in September 2012. The school board, citing a $1.1 billion deficit in addition to huge owed pension payments, wants a three-year deal with a 1 percent raise in the third year. The teachers union wants a one-year contract with a 3 percent raise, in addition to limits to class sizes. 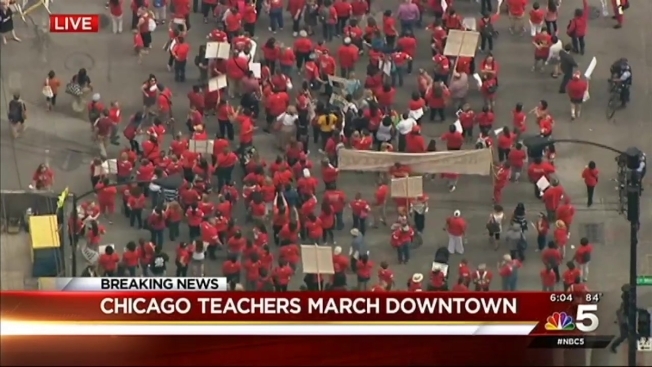 Before beginning their march, the teachers rallied in front of the Thompson Center. They heard from union leader Karen Lewis, who said they were gathering to oppose layoffs and for more resources for public school students.